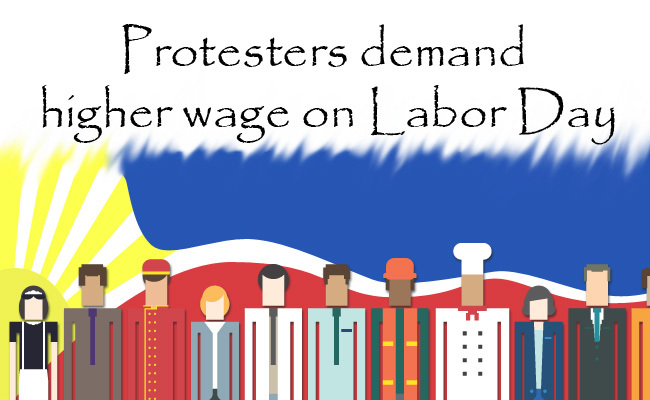 Last April 30, Kilusang Mayo Uno (KMU) revealed that they are one of the groups who is going to protest on Labor Day and it was expected that more than 100,000 supporters will go and they will demand higher wage and put an end to contractualization. Jerome Adonis, a sec-general for KMU revealed that the workers will insists for their demands and increase the minimum wage to Php750 to minimize poverty. They prepared an effigy of President Aquino as a violent butcher and a puppet of US government. They said It symbolizes that Aquino had a vital role on the shooting in Kidapawan last April 1 among others. They also had a mural showing the 3 reasons of poverty in our country: feudalism, bureaucrat- capitalism and imperialism. One of the example worker is Alvin who worked as a sales merchandiser to one of the biggest shopping malls in our country. Alvin worked for the shopping mall for 5 years and he was rehired by his employer every 5 months for his good performance. In a span of 5 years, he had a total of 10 contracts. Last January, he moved to other company and works as a sales merchandiser on a furniture store but he is still on a 5 month contract. Alvin’s situation was known as contractualization where it was practice in shopping malls, construction, hotels and restaurants. The employers uses the 5 month contract to prohibit their employees demand benefits such as SSS and Philhealth. According to Trade Union Congress of the Philippines (TUCP), there were an estimated 25 million workers under contractualization in our country. Alvin revealed on his interview that he is tired on transferring from one company to another and he hopes to have a stable job and wants to enjoy the benefits of what a regular employee is experiencing.